Blu-ray version. "Tenor saxophone master Sonny Rollins has long been hailed as one of the most important artists in jazz history, and still, today, he is viewed as the greatest living jazz improviser. 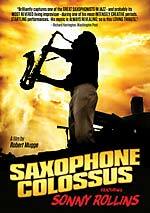 In 1986, filmmaker Robert Mugge produced Saxophone Colossus, a feature-length portrait of Rollins, named after one of his most celebrated albums. The project began in May of that year when Mugge and a small crew accompanied Sonny and Lucille Rollins to Tokyo, Japan where the Yomiuri Nippon Symphony Orchestra premiered his Concerto for Tenor Saxophone and Orchestra with Heikki Sarmanto of Finland conducting and Rollins himself soloing throughout. The next big shoot was in August, when Mugge and a larger crew filmed Rollins and his ensemble performing at sculpted rock quarry Opus 40 in Saugerties, New York. The most surprising part of the latter concert was that, midway through his performance, Rollins leaped from a 6-foot cliff, fell to his back on the ground and, in spite of suffering a broken heel, continued to play his saxophone. Rounding out the production were interviews with Rollins in Japan, with Heikki Sarmanto in Japan, with Rollins and his wife Lucille in New York City, and with jazz critics Ira Gitler, Gary Giddins, and Francis Davis, also in New York City. A soundtrack album, G-Man, released by Fantasy Records, was named by Village Voice music critic Robert Christgau as the best album of 1987, whether jazz or rock, and the fourth best album of the decade. For MVD Visual's new release of Saxophone Colossus on both Blu-ray and DVD, the film has been given 4K remastering, and an updated commentary by Mugge is included as a bonus feature." "Tenor saxophone master Sonny Rollins has long been hailed as one of the most important artists in jazz history, and still, today, he is viewed as the greatest living jazz improviser. 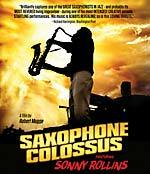 In 1986, filmmaker Robert Mugge produced Saxophone Colossus, a feature-length portrait of Rollins, named after one of his most celebrated albums. The project began in May of that year when Mugge and a small crew accompanied Sonny and Lucille Rollins to Tokyo, Japan where the Yomiuri Nippon Symphony Orchestra premiered his Concerto for Tenor Saxophone and Orchestra with Heikki Sarmanto of Finland conducting and Rollins himself soloing throughout. The next big shoot was in August, when Mugge and a larger crew filmed Rollins and his ensemble performing at sculpted rock quarry Opus 40 in Saugerties, New York. The most surprising part of the latter concert was that, midway through his performance, Rollins leaped from a 6-foot cliff, fell to his back on the ground and, in spite of suffering a broken heel, continued to play his saxophone. Rounding out the production were interviews with Rollins in Japan, with Heikki Sarmanto in Japan, with Rollins and his wife Lucille in New York City, and with jazz critics Ira Gitler, Gary Giddins, and Francis Davis, also in New York City. A soundtrack album, G-Man, released by Fantasy Records, was named by Village Voice music critic Robert Christgau as the best album of 1987, whether jazz or rock, and the fourth best album of the decade. For MVD Visual's new release of Saxophone Colossus on both Blu-ray and DVD, the film has been given 4K remastering, and an updated commentary by Mugge is included as a bonus feature." 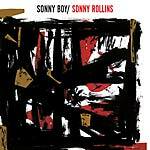 Doxy present a reissue of Sonny Rollins's Sonny Boy, originally released in 1961.This album screams modernity. Rollins plays hard on this superb bop classic. The album contains a combination of two different recording dates from 1956, shortly after the devastating car accident that took Clifford Brown and Richie Powell. 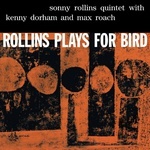 Max Roach, Sonny Rollins and George Morrow still played powerfully, as Kenny Drew filled in nicely. The wonderful hip abstract-expressionist album cover generates the tone contained inside the packaging. Fans of free jazz and bop should not neglect this masterpiece. Edition of 500 (numbered). "Recorded in June 1956 and released in April 1957, Saxophone Colossus is widely considered the masterpiece of his mid-1950s series of recordings for Prestige Records and one of the greatest albums ever issued on that label."